It is a real delight to visit the University of Manchester for the third time. The previous two visits were both three years ago: The first was a “recce trip” for President Xi Jinping’s visit, and the second was to accompany President Xi during his state visit. On both trips, the University of Manchester impressed me deeply as an open and innovative institution forever reaching for the best. Now after three years, I am pleased to be back and it feels really good to reconnect with you. As a renowned institution of higher learning both in Britain and the world, the University of Manchester is the world’s leading university in comprehensive strength and academic disciplines. You have an outstanding list of alumni, including 25 Nobel laureates. You are also the birthplace of many important scientific and technological findings, including “the splitting of the atom”, the isolation of graphene and the creation of the world’s first stored program digital computer. These achievements are a testament to the University’s motto: “Knowledge, Wisdom, Humanity”. I am asked to talk about China-UK innovation and urban development. So let me share with you my views on these topics in the order of your motto, starting with “knowledge”. Knowledge is power. It is the key to innovation. Without knowledge, there would be no human progress. Without innovation, there would be no future for humanity. A new round of scientific and technological revolution and industrial transformation is unfolding. One must catch up with this round of innovation to achieve greater progress for mankind. China is pursuing innovative, coordinated, green, open and shared development. The economy is shifting from high-speed growth to high-quality growth which relies on innovation as the driving force. That means China’s development hinges upon innovation. Innovation holds the key to China’s future. The first feature is the emphasis on high-quality development. Innovation is the primary force of development. China is now in the process of replacing traditional growth engines with new ones. We are shifting from a resource-and-capital-intensive growth model to one that is driven by innovation in science, technology, management, business format and culture. The goal is to improve the quality and efficiency of economic growth. In Beijing and Shanghai, we are building world-class scientific, technological and innovation centres. In central and western regions of China, we are fostering local and emerging industries. In the traditional industrial bases in China’s northeast, we focus on regeneration by promoting innovation in technology and management. China has also been innovative in urban transformation. This is aimed at optimising urban functions and promoting industrial upgrading. Take for example the relocation of non-capital functions out of Beijing. This will stimulate coordination between the Capital and nearby Tianjin Municipality and Hebei Province in the development of the triangular region called the Xiong’an New Area. It is the latest example of coordinated, balanced and sustainable regional development driven by innovation and aiming at high-quality growth. The second feature of innovation-driven development in China is the focus on fostering the best minds. People are the basis and primary resources for innovation. Innovation-driven development is in essence people-driven development. Therefore, in China, we put people first, value the initiative and creativity of the people and respect innovative and creative outcomes. We have been building world-class research institutions, universities and innovative companies. This is aimed at fostering the best minds in innovation, especially hi-tech innovation, and encouraging innovation in education and job training. China has the largest number of R&D professionals in the world for five consecutive years. The total number was 6.214 million in 2017. In terms of R&D spending, China accounts for more than one sixth of the world’s total. In 2017, we spent an equivalent of $258.9 billion, ranking the second in the world. China also encourages the general public to engage in innovation and entrepreneurship. If you have been to China, I am sure you have experienced the convenience and efficiency brought by China’s “new four great inventions”, namely, high-speed rail network, e-commerce, mobile payments and sharing economy. These inventions are the results of effective talent training in a society that values creativity. The third feature of innovation-driven development in China is the pursuit of openness and inclusiveness. This year marks the 40th anniversary of China’s reform and opening up. An important lesson we have learned from these 40 years is that openness stimulates innovation, and innovation in turn leads to greater openness. In a globalised world, protectionism only leads to a dead end. Openness, inclusiveness and win-win cooperation are the right choice if we want development for all. When it comes to innovation, self-reliance and tapping domestic potential are important to a country’s development. But innovation by nature requires an open environment. Therefore it is also important for countries to open the door to exchanges of new technologies and new knowledge. In this process, innovations could reinforce one another and their outcomes could benefit more countries and people. China has adopted an open, global vision. We have actively engaged in cooperation with other countries on innovation. Take for example the protection of intellectual property rights, which is an important basis and guarantee for innovation. At the Annual Conference 2018 of the Boao Forum for Asia last April and the opening ceremony of the first-ever China International Import Expo last month, President Xi Jinping announced a number of new measures for further opening up China’s market. He laid special emphasis on strengthening IPR protection. In recent years, China has expanded and improved IPR protection. We have established a full-fledged system of domestic laws and regulations for IPR protection that conforms to both international practice and China’s national conditions. Intellectual property courts have been set up in Beijing, Shanghai and Guangzhou and specialized IP tribunals have been put in place in 15 cities. In 2001, the first year as a WTO member, China paid $1.9 billion in intellectual property royalties to overseas rights owners. Fast forward to 2017, this figure increased by 14 times to $28.6 billion. China has attached great importance to protecting the IPR of British companies. The number of patent applications by British companies in China, which tops 20,000 in total, says it all. China has also engaged in various forms of international cooperation on IPR protection. We have actively promoted IPR protection under the framework of the Belt and Road Initiative and within the BRICS. We hold regular dialogues on IPR protection with the UK, the European Union and the United States. And we have signed agreements with over 20 countries and regions on Patent Prosecution Highway. These are a few highlights of China’s active efforts in promoting a global intellectual property system that is more balanced, inclusive and beneficial for all. Both China and the UK value the spirit of innovation. In our courageous pursuit of innovation, we have both made important contribution to human progress. In today’s world, countries have interconnected interests and share weal and woe. There is a broad consensus that the outcomes of innovation could benefit as many people as possible. Therefore, it is important that China and the UK enhance cooperation on innovation. I think there are three opportunities for such cooperation. China-UK relations maintain stable development. The leaders of our two countries have on many occasions renewed their commitment to the China-UK “Golden Era”. This has provided firm political guarantee for our two countries to enhance cooperation on innovation. In recent years, China-UK cooperation on the Belt and Road Initiative has gone deeper and become more substantial. This has become a new highlight of China-UK business cooperation. It has also opened up new prospects for building closer partnership in innovation between our two countries. Last month, The Duke of York and the Secretary of State for International Trade Liam Fox led a delegation to the first-ever China International Import Expo in Shanghai. During the Expo, our two sides signed a number of cooperation agreements in the areas of innovation and creative industries. The UK is a world leader in innovation and scientific research, with great strength in basic science. To build a “global Britain” and achieve the goals of its industrial development strategy, the UK is promoting innovation and international cooperation in areas such as artificial intelligence, health care, elderly care, green growth and cultural and creative industries. Likewise, China is fostering innovation-driven development. In this process, China is improving its independent innovation capability in science, technology, engineering and industries. Right now, China is leading the world in telecommunication, aerospace, high-speed rail and nuclear energy. China has a huge market, a complete industrial system and diverse consumer needs. It is also noted for its innovation and efficiency in the digital economy. As China opens its market wider, the world stands to benefit from the huge potential of its cooperation with China. China and the UK have same goals and comparative strengths in innovation. Closer cooperation on innovation between our two countries will promote common development and serve the interest of both sides. Thanks to the tireless efforts of both sides, China-UK cooperation on science, technology and innovation has well-rounded mechanisms, attracts a rich variety of participating entities and takes diverse forms. Our two countries have established the Joint Commission on Cooperation in Science, Technology and Innovation, which held the ninth meeting in London last month. During the meeting, our two sides reached important agreements on the Research and Innovation Partnership Fund. It has provided support to 240 institutions from both countries in more than 460 cooperation projects. The Joint Commission also agreed on the Flagship Challenge Programme and cooperation on innovation, entrepreneurship and personnel exchanges. Towards the end of 2017, our two countries signed the Joint Strategy for Science, Technology and Innovation Cooperation. This is a new blueprint for building closer partnership between our two countries in innovation. Examples of specific projects include: The Pitch@Palace, which was founded by The Duke of York to support innovation and entrepreneurship. This has attracted active participation in China. Another one, the China-UK Innovation Industrial Park in Qingdao, is also making good progress. China and the UK should work together to seize the opportunities, make the pie of innovation bigger and take the lead in innovation-driven development and international cooperation. But how do we achieve all that? First, we should match our strategies in innovation-driven development. These strategies include China’s innovation-driven development strategy and “Made in China 2025” as well as the UK’s Industrial Strategy and its innovation and research strategy for growth. Synergy between these strategies, along with the guidance of the China-UK Joint Strategy for Science, Technology and Innovation Cooperation, will enable our two countries to enhance top-level design and strategic planning for our cooperation on innovation. Our two countries should also enhance policy exchange and dialogue on IPR protection and innovation in green manufacturing. Moreover, our two countries can join hands to engage in global governance in science, technology and innovation. We should play an active role and take the lead in setting global rules and norms on innovation. We should work together to address global challenges such as food security, energy security, climate change and public health. Second, China and the UK should deepen cooperation on science, technology and industrial innovation. and the Innovation Industrial Park. Through these platforms and resources, our cooperation could cover the complete chain of innovation, from basic research to commercialisation. We should also identify priority areas and key projects for cooperation according to the development needs of our two countries. These priority areas could include smart and robot technology, low-carbon and green manufacturing, remote sensing and satellite technology, new energy, agricultural seeds, advanced medical treatment, antibiotics resistance, population aging, creative economy and financial risks management. Moreover, our two countries could explore cooperation with a third country along the Belt and Road routes on science, technology, IPR protection and financial innovation. This could expand our cooperation on innovation beyond bilateral scope. Third, China and the UK should enhance sub-national cooperation on innovation. Northern England, where the University of Manchester is located, was the cradle of the Industrial Revolution. Now, after more than 200 years, economic restructuring and upgrading and innovation-driven development become the key words for this region. The strategies of the “Northern Powerhouse” and “Midlands Engine for Growth” are guiding the rejuvenation of this traditional industrial basis of Britain. These strategies could form a perfect synergy with China’s Belt and Road Initiative and strategy of balanced development between different domestic regions. Northern England has many sister provinces and cities in China. The sister relationships could provide a platform for China and the UK to deepen regional cooperation on innovation. Urban development is another area for potential cooperation. Our two sides could share experience and explore pilot projects on urban upgrading and the regeneration of the rusty-belt areas. We could also focus on sustainable urbanisation and building green, smart and inclusive cities for the future. A couple of such projects are already making good progress, such as the Sino-British Advanced Manufacturing Industry Demonstration Park in Dalian and the China-UK Innovation Industrial Park in Qingdao. Here in the UK, we could encourage and facilitate Chinese companies in taking part in infrastructure building under the “Northern Powerhouse” strategy, in order to improve connectivity and interconnected development in the region. In China, a finance and technology park is being developed in Xiong’an New Area, which is a key part of the coordinated regional development of Beijing, Tianjin and Hebei. This certainly offers a great opportunity for British companies to play a role. The third word of your motto is “humanity”. In this aspect, China-UK cooperation has been a leader of exchanges between China and other Western countries. As we speak, there are more than 170,000 Chinese students and over 6,000 Chinese professors and scholars in Britain. Every year, more than 40,000 British experts work in China. All these numbers top all other countries in Europe. These people form the solid foundation for China-UK cooperation on innovation. In recent years, I have presented the awards for several competitions of the CSSA-UK High-level Entrepreneurship Challenge. Last week, I was invited to sit on the judge panel of the Pitch@Palace Global 3.0 held by The Duke of York, and witnessed the outstanding performance of Chinese entrepreneurs. At such events, I was always deeply impressed by the enthusiasm, creativity and entrepreneurship of the talents from both China and the UK. Going forward, our two countries should continue to encourage our respective scientific facilities to open to each other. We should give priority to exchanges in bio-science and basic disciplines such as mathematics and physics, and carry out joint research on major scientific programmes. We should also expand our cooperation on the commercialization of technology. At the same time, we should encourage more people to engage in innovation, enhance capacity building in training and vocational education for those who wish to engage in innovation or start new businesses, and provide facilitation for events such as Pitch@Palace. We should be creative in boosting China-UK cooperation on innovation. China welcomes the UK’s participation as the only country of honour at the China International Talent Exchange Conference to be held in Shenzhen next April. I am sure this Conference will lift China-UK talent exchange and cooperation to a new stage. 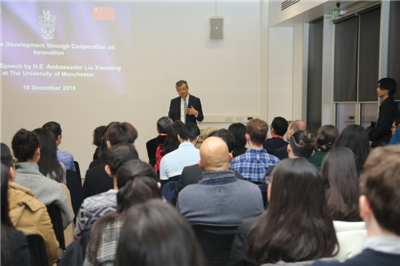 The University of Manchester has worked with Chinese companies on graphene research and products development. It has also carried out productive cooperation with China’s Peking University and Tsinghua University in the areas of advanced materials and bio-science. 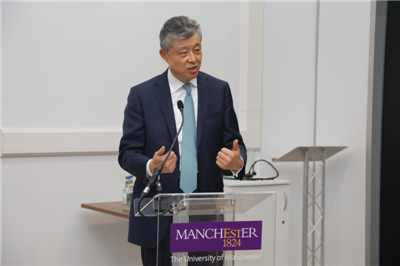 I must say that the University of Manchester is indeed a pioneer in China-UK cooperation on innovation. 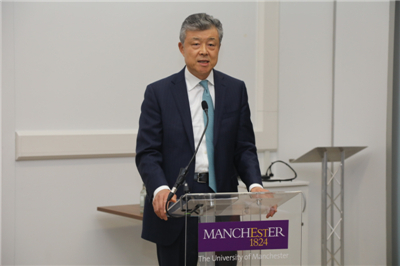 I sincerely hope that the University of Manchester will continue to leverage its strengths, deepen cooperation with China on innovation in the spirit of “knowledge, wisdom and humanity”, and enhance exchanges in personnel training and technology. I am sure you will become a leading brand of China-UK cooperation on innovation. 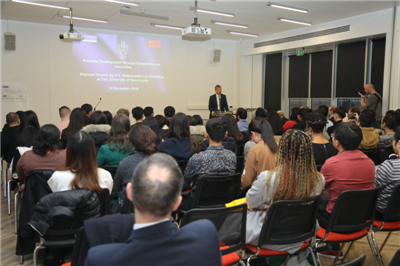 Meanwhile, I hope that more and more students from this University will become active participants in building closer partnership between China and the UK in innovation. I encourage you to contribute your wisdom and strength to China-UK friendship and cooperation. I want to quote an old Chinese saying to conclude my speech. There is no limit to innovation. There is no end to cooperation. China stands ready to work with people from all walks of life in Britain to advance China-UK cooperation in the spirit of innovation, enrich China-UK relations with outcomes of innovation, and make more contribution to the China-UK “Golden Era”!